1. Since, as I understand it, you now have an encapsulated 1kW thermal output module which you can connect in parallel to produce a 1 MW thermal output system. Is this correct? 2. I also understand that each 1kW unit has its own control system. Have you been able to estimate the average effective COP of a 1kW module? 3. I also understand that the grid pattern for a 1MW thermal output system would be four racks (or two racks with front and back insertions) with each rack containing 25 modules horizontally and 10 modules vertically (e.g. x, y). Is this correct? (Four surfaces with each surface supporting 250 modules). 4. At full output power, what will be the environment between the racks? Specifically, will humans be able to access the modules for replacement purposes without shutting down the entire system? If so, what temperature range would such maintenance personnel experience? At the Stockholm demonstration last year, Andrea Rossi calculated a COP of around 600 when comparing his calculation of power going into a QX reactor and the power produced by that reactor, however that calculation did not include the power consumed by the control system; Rossi did not provide that information. From what Rossi has said, currently his team are developing a 1 kW module which is comprised of 13 individual 80 W QX reactors as their first industrial product, but larger reactors are currently under test. The important thing that customers will want to know with respect to the E-Cat is how much money will they be able to save if they adopt it as an energy source, and so the amount of power consumed by the E-Cat’s control system will be very important. Rossi’s statement here about an overall COP – which includes the power consumed by the control system – greater than 6 from a 1 kW module is at least a minimum starting point for us to think about. We have been told on many occasions by Andrea Rossi that the control system is a vital part of the control system, but he hasn’t said very much about it beyond that. A few comments from him recently give us a little bit more idea about its functioning, however. So the greater the fluid flow, the lower its temperature would be, since it has less time to interact with the heat source in the E-Cat. You said that the T of the E-Cat is constant, and the T of the fluid varies according to the flow. You have said the E-Cat reaches very high temperature, so what would happen if the flow was unexpectedly interrupted? Would the E-Cat overheat? The control system would shut down all if the T goes above the allowed limit. If the control system breaks out, or communication with ECat is lost, does the ECat stop by itself? So from Rossi’s responses here, it seems that the E-Cat can start and stop at will, and any malfunction will shut down the E-Cat immediately. 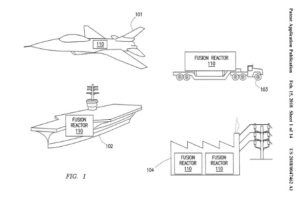 Thanks to a reader for sending a link to an article from The Drive which reports on the recently published patent application from Lockheed Martin for “Encapsulating Magnetic Fields for Plasma Confinement”. The Lockheed researchers believe that they have devised a means of confining the high temperature plasma required for fusion to take place that is superior to the tokamak system used in the large fusion reactors that are being built at projects like ITER. The patent describes using “one or more encapsulating magnetic coils form a magnetosphere around the open-field magnetic system” to achieve the needed plasma confinement. The end goal of the Lockheed fusion project is now very similar to that of Andrea Rossi. The image below is taken from the patent, showing various applications envisioned. Rossi has mentioned recently that with the SK reactors under test he can now provide temperatures with his E-Cat that can meet virtually any purpose, including transportation (for example, he has often stated that the E-Cat could be suitable to drive jet engines). Rossi had been quite dismissive recently on the Journal of Nuclear Physics about hot fusion. Commenting on recent news that in Italy ENEA has invested 500 million euros in a hot fusion research project, he wrote. Hot fusion temperature in a plant like the one ENEA has invested in is above 12 keV ( more than 150 000 000 – say onehundredfiftymillions- of Celsius degrees ). To maintain stable magnetic fields at this temperature is more difficult than allow an elephant pass through a needle eye. Non maintaining a stable magnetic field in a plant like that means not just melt, but vaporize any kind of material or alloy exposed to such a radiation in matter of fractions of second, making happy a lot of people around. But the good news for the “financers”, funded by the taxpayer, are that all this stuff justifies any kind of expense without bids and without control, because nobody understands what they are buying and why… not that it counts too much, though. Rossi may see new investments and R&D taking place in Hot Fusion as a sign of competition. I would think it would be in his best interest to present a product as soon as possible. Thanks to Bob Greenyer for sharing the following. Dr. Alexander Parkhomov produced a program that looked at all of the stable element isotopes and calculated nucleon exchange reactions and fission reactions that lead to stable products with a net energy yield. It took 10 days to calculate the more than 500,000 possible outcomes and their respective energy output. Thank you to Dr. Parkhomov for this work and making the table available. The agreement was signed in January 2018 and the project milestones run through the end of 2020. The United States Naval Institute sponsors an annual essay contest on The Emerging & Disruptive Technologies. The NAVSEA (Naval Sea Systems Command) Facebook page has a picture of Michael Ravnitzky receiving the award. So far I have been unable to find a copy of the essay, but the tweet above says it will be posted at some point in the future. Andrea Rossi doesn’t say too much about how he thinks the E-Cat works, although he reports that he continues to work with Carl-Oscar Gullstrom, and they are planning experiments to test some of the theories they contemplating. Rossi was asked on the Journal of Nuclear Physics this week if he thought the Weak Force played a role in LENR. Some researchers have theorized that weak interactions play a role in LENR phenomona. For example Srivastava, Widom and Larsen in this paper write “electromagnetic and weak interactions can induce low energy nuclear reactions to occur with observable rates for a variety of processes.” NASA researcher Joseph Zawodny also suggested here that LENR used weak forces. Italy invests Euro 500 million in Hot Fusion research. In the latest news, the existing INFN nuclear facility in Frascati (near Rome) will host a Centre for Excellence in Hot Fusion research using an ENEA patented DTT (tokamak) based reactor. Many foreign governments are also contributing a small portion of the funds. The reactor itself will be 10X smaller than the ITER facility. I hope Rossi is on-track to put an end to this absurd waste of funds. These sorts of funds spent on LENR research would go 100X further, and employ thousands more researchers, in discrete and relevant research programs. Clearly, Rossi ( and the E-cat) still has very little traction in Italian research circles, not withstanding the efforts Preparata, De Giudice, Violante, Piantelli, Focardi and Celani.